This will be the first of my posts featuring the sewline mechanical pencils! The next few tutorials and tips will feature fat quarters. The fast piecing tips will each be used to create a table set: coasters & a table runner. So if you want to follow along, have 10 coordinating fat quarters and let's go!! So you know those half square triangles (HST) that you usually sit and chain piece together one at a time? Did you know you can also sew up a whole bunch at one time, with just two fat quarters? 1. Start with two fat quarters that you want to end up with half square triangles. 2. Place them with right sides together. For my project set, I made HST's that measure 3 3/4", after adding 7/8" my cut square size is 4 5/8"
4. First draw a 1/4" - 1/2" line in from all four sides, OR 1" in from the selvage if you have a selvage on your fat quarter. 5. Draw a parallel line 4 5/8" (Or, whatever your cut square size is) from one of the edge lines. Repeat all the way to the end of that fat quarter. 6. Repeat step 5 with one of the perpendicular edges. 7. Starting at one corner draw a diagonal line across the two corner squares (I recommend using a different color mechanical pencil for the diagonal lines). 8. Repeat with the reflecting corner. 9. Draw two more diagonal lines creating a square, or if you have smaller cut square sizes you would just draw the diagonal line all the way across the squares. 10. Draw diagonal lines through the remaining squares. 11. Sew 1/4" inside the diagonal lines. 12. Sew 1/4" outside the diagonal lines. 13. Cut on all the straight lines. and the diagonal lines. 14. Open the seams and press. Tada! You have 24 HST's in a lot less time! The amount of HST's you end up depends on your cut square size, you can end up with more or less. Come back for tomorrow's tutorial to see how we are going to use this pile of HST's! 1. Leave a comment telling me how long it's been since you've done a cartwheel! 2. Go to the Fat Quarter Shop's Facebook page and like it, come back & leave a comment saying you liked it for another chance to win! 3. While you are on Facebook, like my page, come back & leave a comment saying you liked it for another chance to win! Winners will be drawn this Sunday, October 9th. hmmmm. I have a gymnast daughter but I can't remember the last time I cart-wheeled. Maybe I'll try one this afternoon and she can spot me! Thanks for the giveaway! I'd love to try this marking pencil. Liked FQS on FB, too! 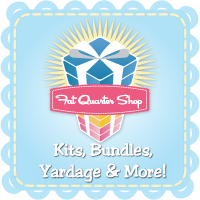 I already like the FatQuarterShop on facebook. I have never been able to do a cartwheel, but it has been about 25 years since I tried! And I love your lessons! It's been decades since I did cartwheels! Would love to win one of those pencils. I like the FQS on Facebook! I have actually never done the cartwheel since I've just started quilting a while ago. So it will definitely be interesting to try this method and I'm bookmarking this page! Thanks for the tutorial!!! I went to the facebook page and liked it, great way to be able to find you easily!!! Less than a year ago my family and I had a blast doing cartwheels and all kinds of other things I had not done since my mid-teens. It was empowering to know that my body still could do those things I loved. Now, you're reminding me of doing it again. I could do one in high school - I graduated in 1976 :) so its been quite some time! lol thanks! Never could do a proper cartwheel, not for lack of trying as a kid. I do think your tutorial is very clever and I am going to try it in future, so could really use one of those lovely pencils. Thanks. Already follow The Fabric Shoppe on Facebook. Honestly, it has probably been around 1-2 years since I have done a cartwheel, though I was never really good at them! I can't even remember the last time I did a cartwheel, it's been so long. The last time I did a cartwheel was maybe 10 years ago, when I was 35 or so. Not a wise thing to do, cuz I've got tendinitis in both shoulders. I paid for it for a few days. Oh, a bit embarrassed to admit this, but I have never been able to do a cartwheel! Thats funny. I id one about 2 months ago at work cause someone said I was too old. I like FQS on Facebook! It's been a lot of years since I last attempted a cartwheel... at least 15! Eep! Thanks for the awesome tutorial and giveaway!